Today’s journal entry will be a very short one owing to the fact that almost nothing has happened. Today, we are travelling from Xi’an to Chengdu by train and will spend all of this afternoon and the whole night on the train with precious little to occupy ourselves. Knowing that there was nothing to keep us busy this morning until we needed to catch our train, we got up very late. It’s so nice to be able to get up exactly when we please from day to day now. They do an American breakfast of sorts in the bar here so we thought we’d give that a try this morning. Before leaving the room, we packed all our things away. We’ve had our two clothes lines strung up all over the room since doing the laundry yesterday. It was quite a challenge moving around in the dark, trying to avoid hanging underwear as we tried to navigate to the bathroom during the night. It took us a little while to pack everything away this morning since we now had our souvenir purchases from yesterday to contend with. They’ve added quite a bit of additional weight to our overall compliment of travelling gear so we’ll be looking to send them home at the first opportunity we get. 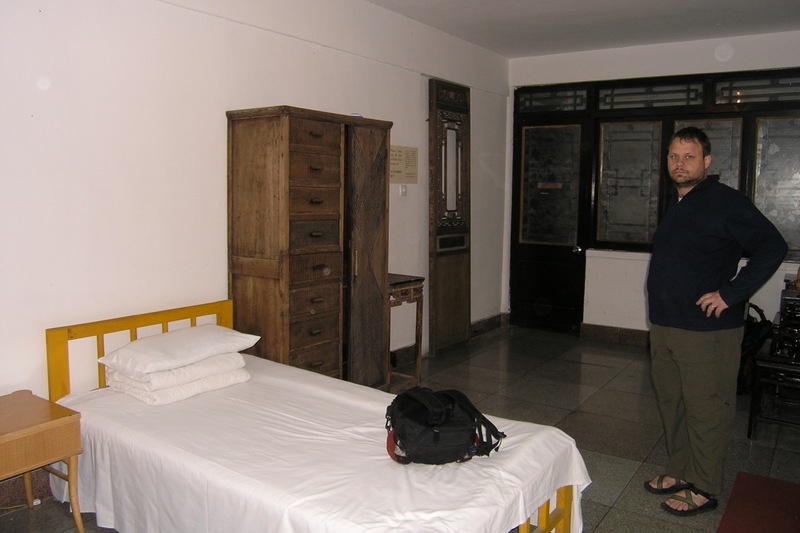 Since we will be spending four nights in and around Chengdu, we’ll probably have time to check out the post office there. Breakfast was mediocre at best but we will probably eat very little on the train and so needed to have a good meal before we set off. Many hostels have a hints and tips notebook lying around somewhere into which passing travellers can write little bits of useful information. This can often be an absolute gold mine of useful local information but the one here is still very new and has just a couple of pages of entries in it, so over breakfast both sandy and I wrote a few things down based on our experiences with Xi’an and Beijing. Hopefully, the travellers to follow us when they arrive here in Xi’an will be able to benefit from what we learned. We made it to the station with little fuss and found our way to the waiting lounge. We did have to pass our entire luggage through the X-ray screener as usual but I happened to notice that nobody was bothering to look at any of the monitors so just what good this does is beyond me. We only had to wait about ten minutes or so before we started the boarding process and were soon on the train. As expected, K-class train is an older model and not quite as nice as the new Z-class that we took from Beijing to here. It’s nevertheless quite comfortable and has pretty much the exact same layout as the previous one, just a little more rough around the edges and no TV screen. I’ll report back tomorrow morning on whether the bed was as comfortable to sleep on. Our cabin mates are a father and son Chinese couple. Dad doesn’t speak any English but the younger man does, although with a little hesitancy, and we spent the first hour or so getting to know each other and talking about the differences between our cultures. We spoke to dad through the Son’s translation back and forth. It wasn’t long before the mandatory staple train food of nuts and noodles revealed themselves and we all had a little something to nibble on. So far, Sandy has done a lot of reading whilst I’ve spent a lot of time catching up on my daily journal entries. I was a full two days behind but have managed to bring everything back up to date with all the spare time we’ve now had on our hands. There is an electrical outlet immediately outside our cabin door but, alas, it isn’t live so I’ve needed to conserve the laptop batteries as best I can by keeping the screen almost completely dimmed. Even so, I’m already down to the last half an hour on the reserve battery already so I’ll have to call it a day soon. It’s been quite pleasant looking out the window and watching China scroll by. We seem to be passing through much more mountainous terrain and this is probably the reason for the longer journey time even though the distance is smaller than the previous trip from Beijing to Xi’an. In reading through some of my journal entries from the past few days, I’ve noticed an unintentional but marked change in my writing style. The initial culture shock of everything being new and different has now pretty much worn off and I find that I’m now writing more about the raw details of what we did each day versus my impressions of what we saw. I think this will be a common theme in each country that we pass through with the initial impressions over the first week or so predominantly occupying my thoughts as I sit and write at the end of each day. I’ve often sat and wondered whether or not my journal entries would be interesting enough to use as the foundation of a travel book of some description at some point in the future. For the most part, I’m writing these entries purely for my own benefit, even though I’ve developed a fair few followers that have expressed enjoyment at following our travels through my writing. Always in the back of my mind, however, is the thought of what other useful purposes to which I can put these memories after the conclusion of our trip. Any and all suggestions will be gratefully welcomed.